Do you want to be kept in the dark about your food? The biotech companies and Big Food are trying to block your right to know if the food you’re eating contains genetically modified organisms (GMO). Prevent states from adopting their own GMO labeling laws. Block any attempt by states to make it illegal for food companies to put a “natural” label on products that contain GMO ingredients. Prevent the FDA from requiring companies to label GMO ingredients and instead continue a failed “voluntary” labeling policy. While we usually support voluntary programs over mandatory, when it comes to GMOs, this is the wrong approach. There has already been voluntary labeling for the last 13 years — and not one company has voluntarily labeled its products as containing GMOs! The companies are essentially committing fraud by taking advantage of the fact that many consumers don’t even realize that they’re eating GMOs. As long as Americans don’t realize that GMOs are in their food, they’ll keep buying these companies’ products. This isn’t how the free market is supposed to work! Because FDA has turned a deaf ear to the public call for GMO labeling (even ignoring the opinions of its own scientists), Americans have turned to the states for a solution. In 2013, over 50 GMO labeling bills were introduced in 26 states, including Hawaii, Washington, Indiana, Missouri, and Vermont. The new federal bill will destroy these grassroots efforts and deprive states of the right to decide what is best for their own residents. The bill has just been introduced by Representative Pompeo, and it has already picked up four co-sponsors: Representatives Butterfield (D-NC), Matheson (D-UT), Blackburn (R-TN), and Whitfield (R-KY). All five lawmakers serve on the Energy and Commerce Committee, which has jurisdiction over GMO food labeling. We need to stop this bill before it goes any further! Call or email your U.S. Representative, and urge them to oppose HR 4432. You can find out who represents you by going to www.house.gov and www.senate.gov or by calling the Capitol Switchboard at 202-224-3121. Call and ask to speak to the staffer who handles food issues. Explain that you’re a constituent and that you want the right to know whether your food contains GMOs — and that the Big Food companies have already proven that they will not do so voluntarily. You can find more talking points in our sample letter, below. A phone call is more effective than an email. If you do send an email, please be sure to personalize the first few sentences so that it’s not just a form message! I urge you NOT to support HR 4432, which would block the mandatory labeling of genetically engineered foods, introduced by Representative Pompeo. The bill does nothing useful — there is no need for Congress to adopt voluntary labeling, since companies have had that option ever since GMOs were introduced in our food supply. 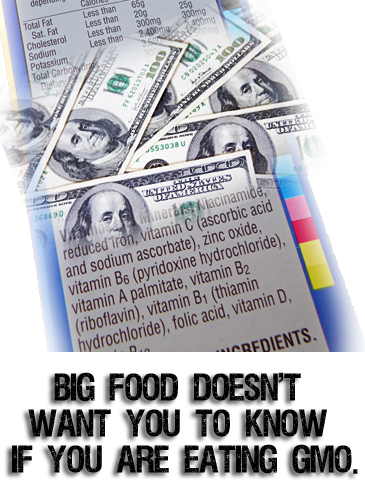 What the bill really does is deny states the right to pass meaningful mandatory GMO food labeling bills. The free market can only work when consumers have the information they need to make informed choices among different products. It is absurd to claim that voluntary labeling addresses the issue. In the 13 years that FDA has allowed companies to voluntarily label genetically engineered foods, not one single company has done so. Without mandatory labeling, consumers are effectively being defrauded. We need change, but this is not it. I expect Congress to support my right to know about the food I purchase and feed my family, not undermine it. Please do NOT support HR 4432 or ANY bill that enacts useless voluntary labeling schemes and denies states their right to pass meaningful, mandatory GMO food labeling bills. Instead, I would urge you to support the Boxer-DeFazio bill to label GMO food (the Genetically Engineered Food Right-to-Know Act) because it responsibly balances the needs of both consumers and companies with an effective national, mandatory GMO labeling plan.